It is perhaps a sign of advancing age that I am finding it increasingly difficult to understand what Thunder Bay’s municipal election campaign is actually about. I found the 2014 municipal election to simply be a wasted election as despite issues like municipal fiscal sustainability, the Kam River Bridge, and the sale of public assets, the entire election was simply fixated on the events centre. This time around, the long-term fiscal sustainability of municipal finances is still an issue as is the Kam River Bridge to which can be added the city’s social fabric as well as Thunder Bay’s economic development and yet to date it appears to have become – and here I suppose I am dating myself again - a Seinfeld Election. That is, despite what are acknowledged by many to be a host of issues, it appears to be an election about nothing in particular. Aside from campaign signs dotting the landscape at strategic street corners, I have met only one candidate on my doorstep and only two have left literature. I have yet to become aware of any scheduled public debates. 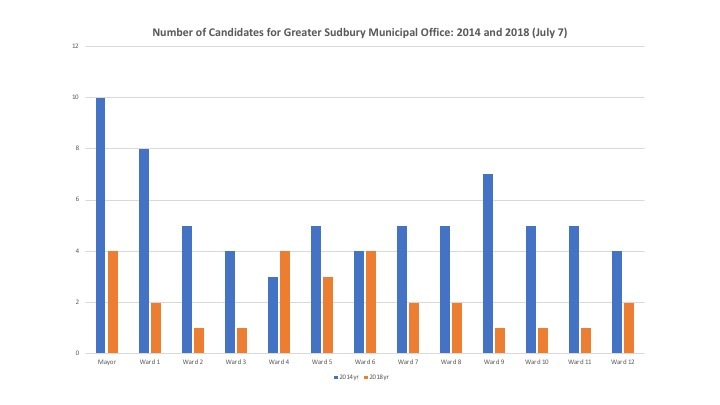 This is during the course of a campaign with a record number of candidates – 11 for the position of Mayor alone with another 26 vying for the At-Large councilor positions – which no doubt complicates the traditional debate framework. Indeed, how can we have a meaningful discussion in which 11 candidates for Mayor can outline how they see the state of the city and offer analysis and solution? Incumbents for the At-Large positions must be silently laughing all the way to the proverbial bank given the difficulty of numerous candidates swimming like so many salmon upstream to stake out a position and gain visibility. 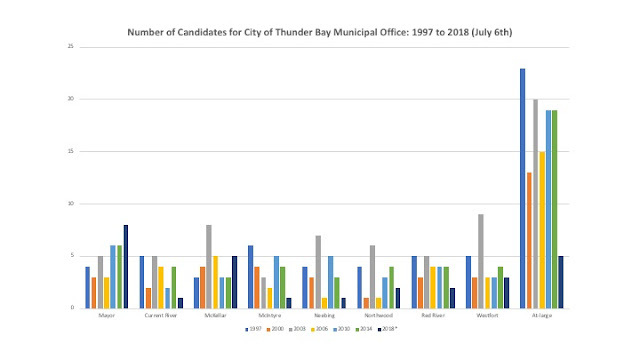 With traditional election campaigns difficult to conduct, this appears to have become Thunder Bay’s truly first complete social media election campaign which complements the debut of internet voting nicely Many of the candidates – but not all - appear to have developed extensive web presences and have Facebook profiles full of photos and videos showing smiling candidates in assorted municipal action poses. There are catchy slogans and mission statements that describe themselves as accountable community activists, serious leadership, concerned with the social fabric, and even showing transformative leadership. There are candidates claiming to be working for you, others putting Thunder Bay first or working together for a Thunder Bay that works, some posing with old family friends and seniors, and many updated profile photos showing youthful smiling vigour. If they have received endorsements, they are highlighted along with any favorable media coverage. Indeed, if one were to judge Thunder Bay by the Facebook profiles of its municipal candidates one could only conclude that our community is definitely one big happy place full of wonderful smiling people whose major source of gainful employment is posing for pictures. There are even some alliances being formed between candidates as they campaign together. There is one slate of five councilor At- Large candidates that aims to put people and the planet first under a time for change slogan. Then there is another alliance between one incumbent and one new entry in the At-Large race that is marketing itself as political twins working for you. I suppose this is a political variant of a two for the price of one marketing ploy. Or perhaps, vote for one, get one free. In the end, all of this seems to me to be mainly style over substance. Needless to say, election campaigns have always been dominated by style over substance with serious policy discussion seen as a dangerous luxury – especially for incumbents. In the end, polite conversation at least in the social circles I move in appear to have narrowed down the issues in this election to three: a need for major change in representation given that many on council are long in the tooth, taxation rates and cost-effective municipal services, and social issues with an emphasis on crime and public safety. If this is not be another wasted election, we need candidates to address how they would reduce crime and improve the social fabric and how they would pay for it given what has been a steadily rising municipal tax burden that has shifted largely to the residential ratepayer. We cannot afford to waste another election. We are about six months away from Thunder Bay’s next municipal election and the race for the mayor’s chair and council spots represents an opportunity to examine directions and priorities. The last election was obsessed with the event centre and the issue was a distraction from important issues such as the sale of municipal public assets, economic development, the city’s economy, the sustainability of municipal finances as well as the ongoing saga of infrastructure renewal and in particular the James Street Bridge which has now been closed to vehicular traffic since 2013. Sadly, with the exception of the events centre, which has ridden off into the sunset for the time being, all of these other issues are still ongoing. And of course, added to all of these issues are those with respect to relations with First Nations as well as court cases involving the city’s politicians and administration. Needless to say, Thunder Bay has garnered an inordinate amount of negative attention on the national stage in areas under the purview of municipal government and such attention is certainly not a magnet for business investment. When it comes to economic development and the city’s economy, it remains that both population and employment levels in the city have been flat for the last four years. The low unemployment rate in the city results from a labour force that has shrunk faster than employment and of itself is not a positive harbinger for the future. Waiting for the Ring of Fire to kick start the economy appears to be a process akin to Waiting for Godot and all the talk of smelter locations in the world will be of no avail given low current chromite prices. As for the current trappings of prosperity in the city, they are largely the result of a large public sector and associated public spending which after the June provincial election could very well come to a crashing halt. Of course, even without long term private sector wealth creation, the illusion of prosperity created by public sector spending has helped fuel municipal government spending and tax increases which over the last few years have averaged above the city’s inflation and GDP growth rates. Moreover, there has been a continued shift of the tax burden onto the residential ratepayer and they now account for about 70 percent of tax revenues. Added to this are the continued steep increases in user fees and charges which given the talk about “rainfall taxes” show no sign of abating anytime soon. Indeed, the thirst for residential tax revenues also results in city council giving the go ahead to new urban residential developments outside core areas that while adding to the tax base in the short term also add to urban sprawl and require municipal servicing whose maintenance will add to city expense in years to come. The sustainability of this type of short term development formula should be a topic for debate and discussion but again it is an issue the politicians are happy to ignore when it comes to an election year. So, what is to be done? Well, for starters Thunder Bay residents need to pay closer attention to the fiscal, economic and social issues affecting the city and ask candidates more pointed questions about what solutions might help address the situation. Perhaps one should ask why anyone might want to buy a new house in Thunder Bay if the property tax bill for a new bungalow is going to be in the range of $5000 to $7000 onto which will be added another $1000 a year in water and sewer charges. Given the length of tenure that many current members of council have had, a legitimate question is whether or not Thunder Bay might not be better off with a substantial transfusion of new blood on City Council with new ideas and new energy to look at new ways of doing things. After all, current members of City Council have generally been the most comfortable with solutions that involve raising taxes and spending more money. While the claim is often made that millions in efficiencies and savings have been implemented, the fact is the tax levy continues to grow which means total spending is going up and not down. Making Thunder Bay’s next municipal election count requires making an effort to create real change in the way municipal issues are dealt with and that requires some new blood. It truly is time for change. Well, it is the New Year and as always it is a time of reflection and looking ahead to see what the New Year might bring for Canada, Ontario, northern Ontario and naturally The Most Serene Kingdom of Thunder Bay where there is always optimism. Of course, 2017 has been a pretty tumultuous year but 2018 is also looking turbulent given the changes poised to take effect as well as events around the globe. 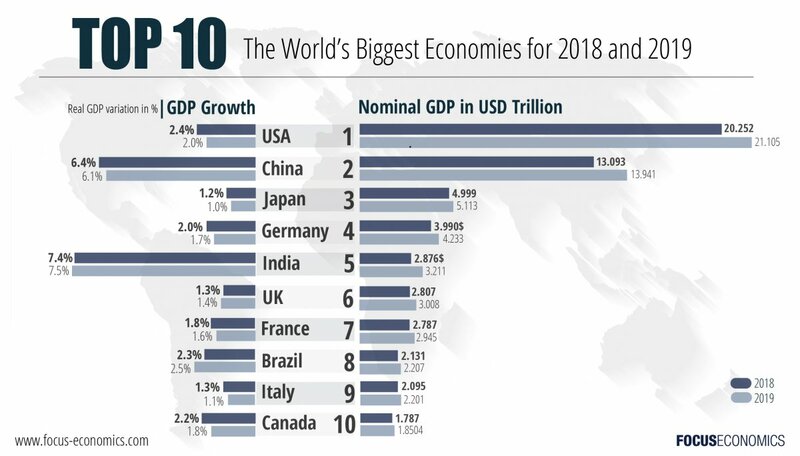 However, on the bright side, the global economy is expected to do reasonably well according to Goldman Sachs or then perhaps not if you listen to Morgan Stanley. 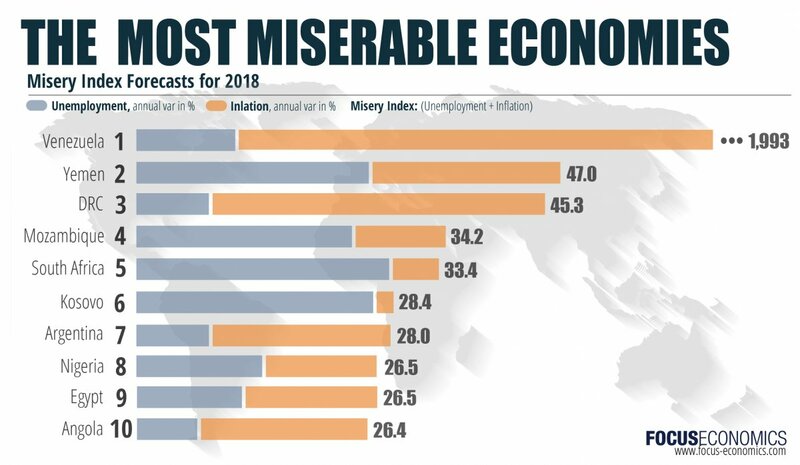 At least, Canada will not be Venezuela which FocusEconomics expects to be 2018’s most miserable economy though Canada is expected to be in the top ten for nominal GDP. Nevertheless, this year will certainly be a test of the aspiring nature of current economic policy in Ottawa and Queen’s Park. At the top of the list, the United States will dramatically lower business and personal tax rates effective January 1st. The last time this happened in the 1980s, Canada countered with the federal tax reforms that lowered rates and broadened the rates. This time, no such response appears to be coming despite the fact the federal business tax rate in the United States is expected to fall from 35 to 21 percent. A saving grace is that new US corporate tax rates will match rather than fall below Canadian ones. If the US economy booms in the wake of its tax cuts, Canada might be expected to benefit from increased trade. Yet, federal economic leadership is adrift on the trade front given the United States is playing hardball on NAFTA and talks with China and the Asia Pacific are stalled. The aspirational tone of current trade talks is not bearing fruit given Chinese and American reactions. Indeed, the possibility is high that Trump will pull the plug on NAFTA early in the New Year. On the plus side, we can take solace in the fact that while the United States is playing hardball on trade, Donald Trump considers Justin Trudeau a “friend”. One can only imagine our trade talks with the Americans if Donald Trump was dealing with enemies. Perhaps we can look forward to a visit to Canada by President Trump in 2018. At the federal level, we can also take cheer in the most recent Federal Department of Finance’s long-term projections (a few days before Christmas when no one is paying attention) that the federal budget is now expected to be balanced by 2045 compared to the 2050s as forecast in last year’s long-term forecast. Given the international situation with North Korea, the United States, Russia, China, and the Mid-East, the world should last so long. Where is Lester Pearson when you need him? Added to all this are expected increases in interest rates for 2018 and the tightening of mortgage rules with a new stress test. The stress test will effectively function like an increase in the interest rate for home buyers without the added stress of implementing an actual increase for the Bank of Canada. These changes are anticipated to have a depressive effect on Canadian housing markets especially outside of Toronto and Vancouver. As for Toronto and Vancouver, being in an economic world of their own, they should only slowdown a bit. Things are marginally better when moving into Ontario. Ontario’s economy has done relatively well in 2017 though NAFTA talks are inevitably keeping Premier Wynne awake at nights. While Ontario is expected to balance its operating budget, debt will continue to grow based on the forecast capital spending ranging from public transit to high speed rail. Yet, it is also not a done deal that Ontario’s era of deficits is over given what appears to be a ramping up of spending with implications for the future. Moreover, the increase in the minimum wage and other regulatory changes that are being phased in with respect to employment standards, scheduling, and overtime mark the debut of a massive experiment. How much change can employers absorb before throwing up their hands and scaling down their operations? Ontario is also on track to a June election and many of the progressive initiatives of the current Wynne government are designed outflank the NDP given the Conservatives under Patrick Brown have sailed into the centre of the political spectrum with their policies. The Wynne government’s policies are aspirations for a more socially just Ontario with less weight placed on trade-off between equity and efficiency. Along with the guaranteed annual income experiment, there is also a new youth pharma care program. In the end, all three political parties in Ontario appear to be placing themselves along a centre-left alignment meaning that Ontarians can expect government spending and debt to maintain their current trajectories no matter who wins. Of course, more government spending will be seen as good news for northern Ontario given the economic dependence on government. While the resource sector saw some marginal improvements in 2017, the development of the Ring of Fire still appears to be quite distant though 2018 being an election year one can expect to see a number of positive inspiring announcements with respect to its future. As well, it will be interesting to see if there is any mention of the “success” of the Northern Ontario Growth Plan in the next provincial election campaign. Any mention of the 25 year plan to boost the economy of northern Ontario that started in 2011 will likely mention the wonderful things yet to come - after all, we have yet to reach the halfway mark. As for Thunder Bay, its economic engine is government activity as the core sector with subsequent commercial and retail activity an economic multiple of this core. It is a recipe for stability that works given that the city’s economy has been static in terms of employment for several decades. Rising public sector salaries and incomes provides a base for municipal taxation and further local public-sector employment and the process will continue until the flow of public money is constricted – which does not appear to be any time soon. Why tamper with perceived success? This means the current batch of local politicians – provincial and municipal – will all be re-elected come June and October and everyone will go back to sleep. The northern Ontario economy and Thunder Bay in particular have become a sort of economic Brigadoon – an isolated sleepy region coming magically to robust economic life every 100 years. Yet, despite the evidence of slow economic and employment growth from Statistics Canada and the Conference Board, its boosters have often maintained that Thunder Bay is one of the fastest growing cities in Canada and with some of the lowest unemployment rates in the country. That the low unemployment rates in Thunder Bay's case also mean the labour force has been shrinking faster than employment is apparently not seen as a cause for concern. I suppose it depends on what indicators you wish to measure growth with and your interpretation of the evidence. I guess who am I to argue with Thunder Bay’s ruling political class when it comes to the interpretation of economic arguments and indicators. In the end, their attitude towards and understanding of economists is best summarized by the line once made by one city politician:"You want to listen to economists? They record history. They don't make history." Given the last real boom period in northern Ontario was the resource commodity and baby booms of the 1950s and 1960s, we can expect the regional economy to again awaken circa 2050 – roughly the same time the federal budget is expected to balance again. By then, perhaps the federal government will carry the public sector spending ball for northern Ontario and give the provincial government and municipalities a rest. Happy New Year and may God save us all.